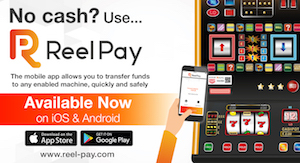 Innovative Technology has developed a mobile app, ReelPay, that allows customers to transfer funds to any enabled reel based or digital gaming machine. A QR code is scanned, enabling players to deposit funds securely to an individual gaming machine via their smartphone using their debit card. Andy Bullock, senior business development manager, said: “Following successful trials in 2018 on both reel based and digital machines at a number of sites across the North West, ReelPay is now available as an easy-to-use alternative payment solution. We are specialists in automated transactions and have been providing note validators to the gaming industry for over 27 years, so are ideally placed to draw on this market experience to effectively bring this product to market. ReelPay has already been successfully demonstrated at EAG and ICE at the beginning of the year and this was one of the most popular new products that we had on display. “ReelPay has many benefits for players, operators and pub retailers alike. Not only does it give customers more convenience and choice, it provides operators with a cashless payment option to significantly optimise cashbox performance and revenues. The real operator benefits of ReelPay come from our Live Collect system, which runs in the background providing real-time data and transaction reporting across machines and sites. It revolutionises collection routines and provides 24/7 machine audit traceability and performance. In addition, remote download of currency datasets and firmware is available saving both time and money. "Reel based AWP’s use a standalone system with no need for any networking infrastructure. The system utilises one of our note recyclers (Smart Payout, NV11, or new NV22 Spectral) to pay-out winnings in convenient cash so single and multi-site Retailers can benefit as the cash generated stays within the pub/venue. Digital machines utilising the GBG standard industry protocol can transfer funds back to the app for a seamless player experience." The app is now freely available in the UK and can be easily downloaded from the App Store and Google Play.